PVC Coated Overlay Films & Sheets are similar to PVC uncoated overlay in terms of thickness & colour & used along with PVC Core Sheets for making ID Cards & smart cards. 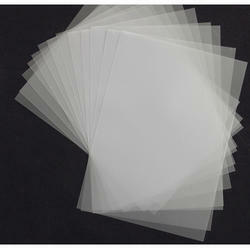 However, they main difference between these two types are that PVC Coated Overlay sheets come with coating on on side. These sheets are are not sued for printing. They simply offer protection to the printed surface of the card. They are fused along with PVC Core & Teslin Sheets to make a 3 layered smart cards. 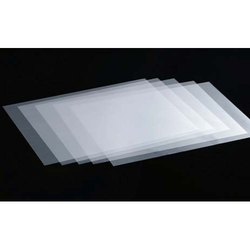 These films & sheets come in thickness of 0.06 mm to 0.40 mm. The fered sizes are usually A4, A3, 12" x 18", 12.5" x 19", 19" x 24", 19" x 25"
Keeping in mind the diverse requirements of the clients, we are involved in offering a wide range of PVC Coated Overlay Film. These are widely used and are highly appreciated among our clients due to their perfect finishing and long life. Our clients can avail these in various specifications as per then clients needs. Moreover, we also assure safe and timely delivery of our products. To furnish diverse requirements of our clients in best possible manner we are offering a wide range of PVC Coated Overlay. These are made using fine quality material which we sourced from the certified vendors of the market. We offer these in various sizes and thickness as per the clients requirements. Additionally, these are available in market at reasonable prices. Looking for PVC Coated Overlay ?